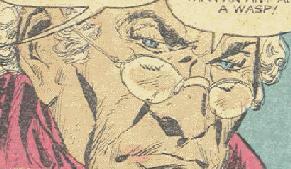 Powers/Abilities: Trago was trained in the means to mystically control people and animals. Using his trumpet, he could make people follow his commands or cause them to feel whatever emotion he wished. 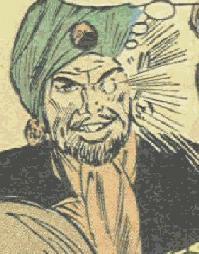 Trago's memory was erased, so he currently no longer possesses these abilities. History: (Tales to Astonish I#47) - Trago was originally an ordinary jazz musician, but one day he saw his employer had left the safe open and he stole the cash boxes. Unfortunately for Trago, Ant-Man and the Wasp had chosen that night and that club in which to spend an evening. The two heroes heard the manager trying to stop Trago, and stopped him and forced him to return the money. Because of their previous friendship, the manager decided not to press charges against Trago, but instead told him to leave and never return. The manager even booked Trago a seat on the next flight leaving New York, which took him to New Dehli. Two months later, unable to get work in India, Trago was found feverish and starving by Ghazandi, a mystic and scholar of ancient phenomena. Trago learned that Ghazandi was a musician as well, and convinced him to train him. Ghazandi trained Trago to play notes that few people knew, as well as how to mesmerize cobras. Eventually, Trago finally convinced Ghazandi to train him how to hypnotize humans, although Ghazandi warned him that if he played the wrong notes, he too would be affected..
Trago returned to America and formed a new band based out of Connecticut. He hypnotized his band members so that they could play the music he wished and not be affected by it. Trago and his band would mesmerize audiences and then steal their valuables. Beginning to realize his potential, Trago next got his music played over the radio in New York, successfully entrancing a large portion of the city. Ant-Man and the Wasp were unable to fully resist the music, but before they succumbed, Ant-Man summoned a group of ants to take them to safety. Trago next used his broadcasted music to mesmerize the reptiles in the gardens and the fields and send them after the two heroes. The two were nearly killed by a snake, but they succeeded in using their reducing gas to shrink the snake down to a size where the ants could overcome it. 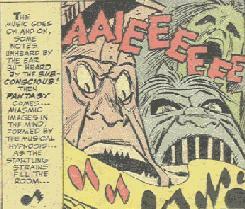 Using their cybernetic equipment to block out Trago's music, Ant-Man and the Wasp traced Trago to his base and incapacitated his musicians. 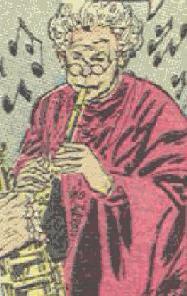 Ant-Man succeeded in entering Trago's trumpet and bending one of its pipes. When Trago tried to play it again, the altered notes affected him as well. Trago's memory of his entire life since he first started playing the trumpet was wiped out, and he gained a chance to start anew. Comments: Created by Stan Lee, H. E. Huntley, and Don Heck. 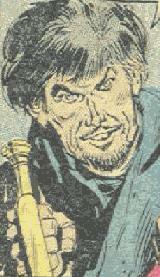 Trago has an entry in Marvel Legacy: The 1960s Handbook. His real name was revealed in his profile in OHOTMU A-Z HC#12. Ghazandi was Trago's former mentor who taught him first how to mesmerize cobras, and finally how to hypnotize humans with his music. He warned Trago that playing the wrong notes could result in affecting oneself. His fate is unrevealed.